You will need the Adobe Acrobat Reader to view this and other PDFs on this page. One of the most problematic intersections in Tiverton, Rhode Island is located in Bliss Four Corners. Unfortunately, there was no bliss at this location as seventy crashes occurred from 2007 to 2009. Twenty percent of the crashes involved injuries, with rear-end and angle as the most common crash-types. Bliss Four Corners is comprised of residential and commercial developments, as well as a new elementary school. To reduce the high number of injury crashes and focus on access management issues at the intersection of State Route 81 and State Route 177, Tiverton decided to perform a Road Safety Audit (RSA). Since this was going to be their first RSA, the town submitted a request to FHWA for peer assistance. A Peer was selected based on experience performing RSAs at intersections as well as knowledge of the Safe Routes to School Program. 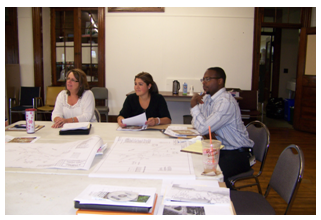 Site visit preparation: (left to right) Deirdre Paiva, Kristen Capaldi, Wellington Hall. IMAGE COURTESY of Town of Tiverton, RI. Vertical curve in roadway at RSA location. IMAGE COURTESY of Town of Tiverton, RI. The RSA was performed by a multi-disciplinary team of local, state, and federal stakeholders from organizations such as the planning department, police, school, as well as the Rhode Island Department of Transportation (RIDOT) traffic engineering unit. After several weeks of phone calls, the Peer assisted the RSA team onsite with performing the RSA. The team identified 22 suggestions for improvements. Audit recommendations included refurbishing pavement markings, ensuring consistent sign placement, replacing signs in poor condition and upgrading signs to MUTCD standards, and relocating existing curb cuts further from intersections. 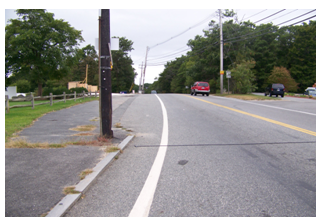 Since completing the RSA, Tiverton has applied for funding under the State Transportation Improvement Plan (TIP) to improve curves, sidewalks, striping, traffic signals, ADA-compliance, and signage. Additionally, the planning board required a new development neighboring Bliss Four Corners to address sidewalk issues identified in the RSA. One key piece of Peer advice was to include key stakeholders during the RSA, such as law enforcement and local business owners. At the suggestion of the Peer, the RSA team asked the local police chief to join the crash data discussion and visited local businesses during the field review to hear safety concerns. "Cooperation is key," says Kate Michaud of the Tiverton Planning Department when explaining the importance of agencies working together to make the area safer for drivers and pedestrians. The Peer also provided guidance on preparing for the RSA and detailed how her locality identifies its most problematic intersections every year and then performs an RSA at each one. Tiverton is now considering using a similar process and is already identifying the next intersections where they would like to perform RSAs. The Peer also shared how the locality could monitor results of the RSA recommendations. Michaud summarized that, "Having the Peer there was invaluable. She helped lead the project and taught everyone the basics of the RSA program. Having someone in town who had completed an RSA before was of the most importance." What is the Roadway Safety P2P Program? In order to reduce fatalities and serious injuries on our Nation's road network, highway practitioners routinely integrate Road Safety Audits (RSAs) into their projects and programs. FHWA established the P2P Program to provide technical assistance on a broad range of safety topics including RSAs. For example, RSA experts volunteer their time to serve as Peers and provide guidance to agencies requesting assistance. Short term technical assistance may be provided through phone calls, email exchanges, or on-site assistance. For more information on the program, or to submit a request for assistance, visit http://rspcb.safety.fhwa.dot.gov/p2p/p2p_app.aspx.